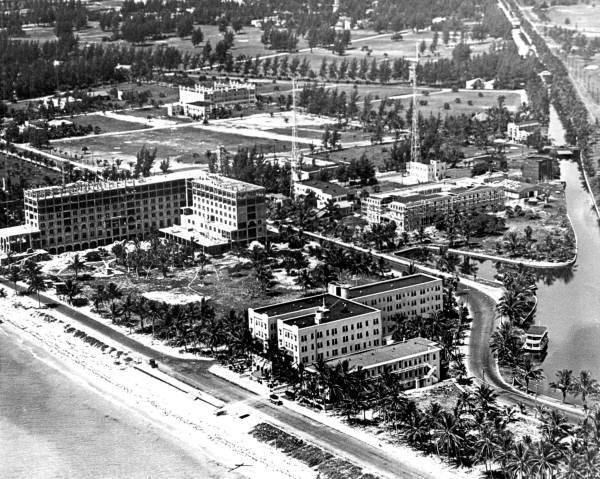 If Jay Gatsby needed a retreat from the lavishly loud parties on Long Island, no other hotel could accommodate him better than the legendary Roney Plaza Hotel on Miami Beach. The Roney Plaza was located between 23rd and 24th Streets on Collins Avenue. 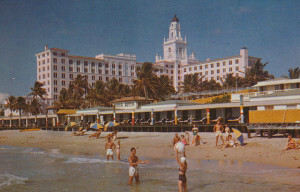 Before the mega hotel industry explosion on Miami Beach, the Roney Plaza was place to be during the winter season each year. 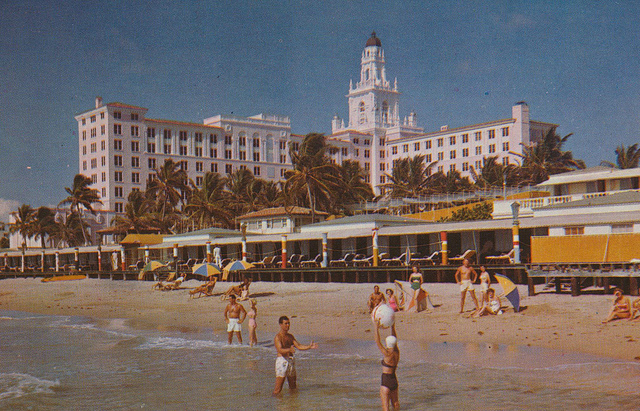 The hotel was a product of Miami’s 1920s Land Boom Era before the devastating 1926 hurricane. 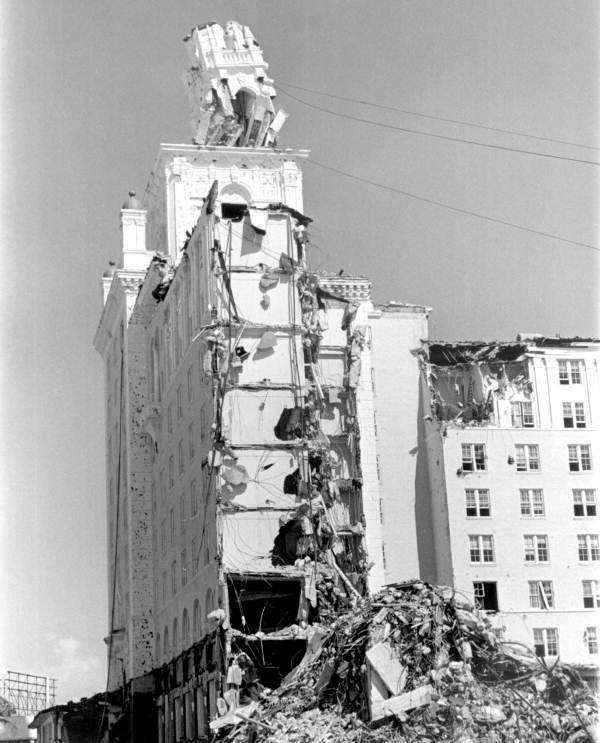 It was one of three major Miami projects designed by the architectural firm Schultze & Weaver—the others were the Miami News and Metropolis Building (now the Freedom Tower) and the Biltmore Hotel in Coral Gables. All three buildings were modeled after the fabled Giralda Tower in Seville, Spain. The firm’s South Florida projects are fine examples of the Mediterranean Revival style aesthetic—a combination of Spanish, Baroque, and Moorish architectural influences with a touch of South Florida elements. 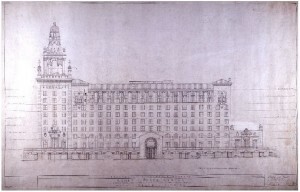 The firm also designed The Breakers Hotel in Palm Beach and the Waldorf-Astoria in New York City. 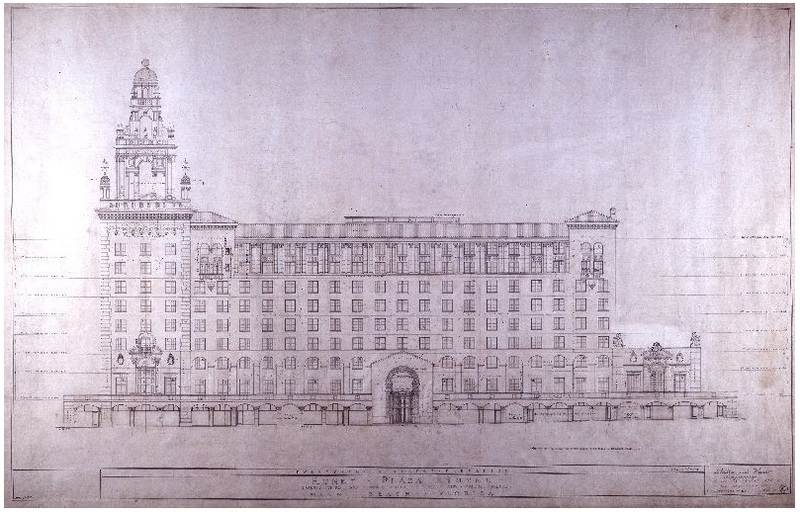 Schultze & Weaver became synonymous with the grand hotels from the Jazz Age. In 1925 Miami Beach developer N.B.T. 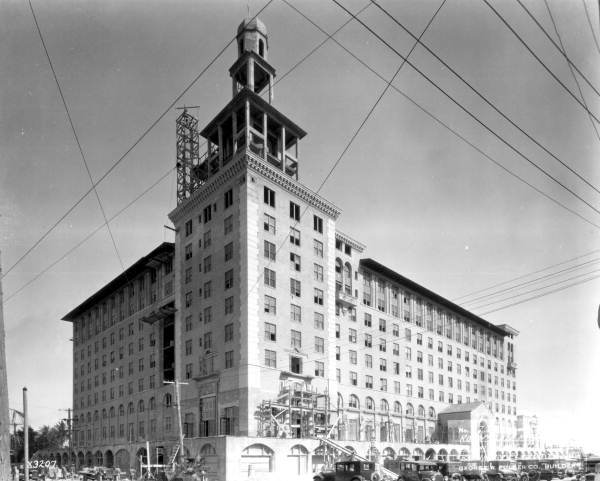 Roney purchased the site on which the Roney Plaza Hotel was built on for $2.5 million. 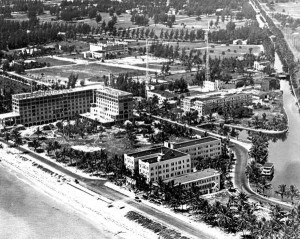 The hotel, which was Miami Beach’s first world-class oceanfront resort, opened in February 1926 featuring acres of formal gardens, 1,500 feet of ocean frontage, a Burdine’s store (only resort wear and accompaniments were sold though), and the nationally recognized Bamboo Room and Restaurant. 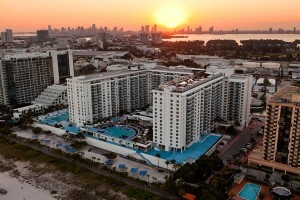 It was the first hotel on Miami Beach to offer cabanas, tennis, and golf putting greens on site. 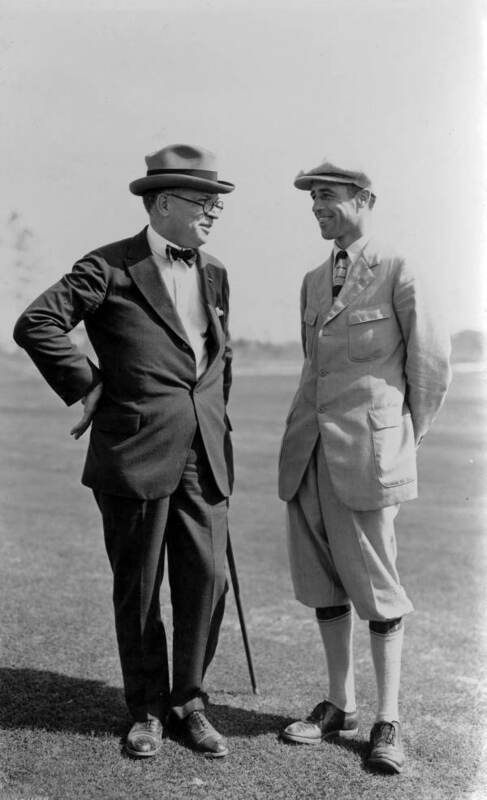 The star-studded guest list included Orson Welles, Rita Hayworth, the Duke and Duchess of Windsor, and Desi Arnaz and his orchestra regularly performed there. In 1966, despite the hotel’s popularity, the building was bought by developer Harry Mufson for an estimated cost of $3.5 million triggering the beginning of what would be many changes to the property. 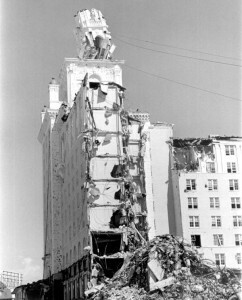 In July 1968 the entire structure was demolished to make way for a 14-story, 1,162 unit high rise building. The “new” Roney Plaza, designed by architect Melvin Grossman, was a U-shaped rectangular luxury apartment complex during the 1970s. It was again sold in 1980 to Canadian developer Alec Kotler for $65 million and later was converted into a condominium complex known as the Roney Palace. By 2008 the site would become the Gansevoort South hotel and in 2012, after new ownership, the hotel became The Perry South Beach—a hotel and residential building. After a year, though, Starwood Capital Group, the property’s present owners, ceased operations in order to start a $100 million renovation. 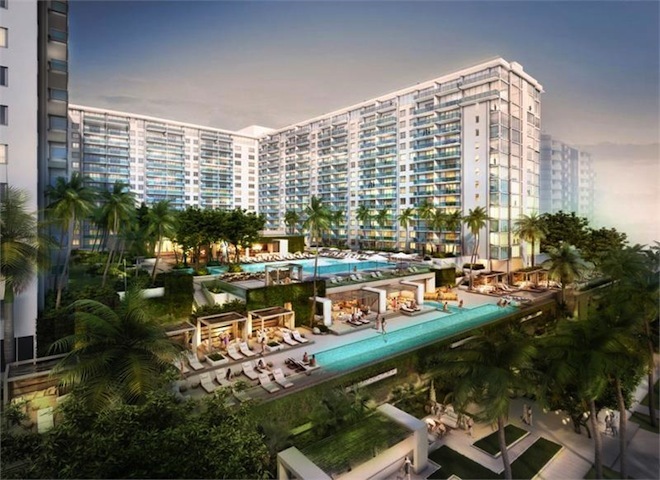 In 2014 the 1 Hotel & Homes South Beach—a 417-room hotel with 163 residences—will open. The property will include four pools, a restaurant, a private lobby area for arriving residents, and a new boardwalk. The 1 Hotel brand will also open two properties in New York by 2015. The brand markets itself as an “eco-conscientious” lifestyle for the wealthy, a 21st-century spin on the Jazz Age luxury of the Roney Plaza Hotel. This entry was posted on Thursday, February 6th, 2014 at 4:40 pm and is filed under Audio, Contemporary, Mediterranean Revival, Miami Beach, Schultze & Weaver, Videos. You can follow any responses to this entry through the RSS 2.0 feed. Both comments and pings are currently closed.